At Moll Law Group, our experienced pharmaceutical lawyers have helped to secure billions of dollars in settlements and judgments for injured consumers. We have handled many cases involving drugs that harm people who rely upon them for treatment of their medical conditions and illnesses. Recently, a number of product liability claims have arisen across the nation concerning a class of drugs known as proton pump inhibitors (PPIs). One of these drugs is Dexilant, the brand name for dexlansoprazole, which usually comes in a delayed release capsule and is most commonly prescribed for treatment of gastronomical ailments such as gastroesophageal reflux disease (GERD) and heartburn. If you or a loved one has taken Dexilant and experienced acute interstitial nephritis, chronic kidney disease, and renal or kidney failure or other harmful side effects, the Dexilant lawyers at Moll Law Group are available to help you pursue compensation for your injuries. 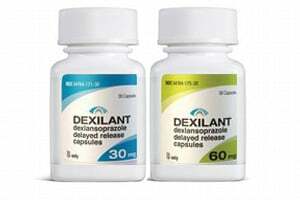 Dexilant and other PPIs decrease the amount of stomach acid that a patient produces. Most of the side effects of Dexilant (diarrhea, stomach pain, nausea, vomiting, and gas) are not life-threatening, but recent studies have indicated that there could be serious, potentially fatal illnesses in some patients who take PPIs. Proton pump inhibitor users who developed complications such as acute interstitial nephritis, chronic kidney disease, and renal or kidney failure may incur considerable medical expenses, may experience severe pain and suffering, and may lose part of their earning potential if they become partially or totally disabled. Families who lose loved ones due to PPI-related medical conditions also may suffer great financial difficulties and emotional distress associated with their loved one’s death. Claimants in product liability lawsuits, including those arising because of an unreasonably dangerous drug, sometimes have the option of pursing multiple theories of liability against the defendants in the case. The plaintiff has the burden of proving all of the elements of each claim by a preponderance of the evidence, which requires showing that they are more likely than not to be true. Different theories of liability require proof of different elements by a Dexilant attorney. For instance, a claim of negligence requires the plaintiff to prove that the defendant owed a duty of care, the defendant breached the duty, the plaintiff suffered injuries, and there was proximate cause linking the breach of duty to the injuries. A strict product liability claim, by contrast, does not require the plaintiff to prove that the defendant acted in a wrongful manner but only that the product itself was unreasonably dangerous when it left the manufacturer’s control. Causation must be shown in strict liability claims as well. Defendants tend to fight back vigorously against assertions of liability, sometimes raising affirmative defenses. These may include arguing that the plaintiff should be barred from recovery or receive a lesser amount of compensation due to assumption of the risk, misuse of the product, or comparative fault. Different comparative fault rules apply depending on the state in which the claim is brought. Only a few states bar compensation altogether for a victim who was at fault to any degree, but others bar compensation if a victim was 50 percent or more (or in some cases 51 percent or more) responsible for the harm. Many states apply a pure comparative negligence system in which the victim’s compensation is reduced according to the degree of his or her fault, but the compensation award is not eliminated unless the victim was completely responsible. A knowledgeable product liability attorney can help you counter any affirmative defenses, such as those related to comparative fault, and try to prove that the defendant was completely or mostly responsible for your injuries. If you have been diagnosed with acute interstitial nephritis, chronic kidney disease, renal or kidney failure or suffered other severe, life-threatening complications after using Dexilant or any other proton pump inhibitor, you should discuss your legal options with a proton pump inhibitor attorney as soon as possible. The experienced team at Moll Law Group fights for the rights of people who have been hurt or lost their lives because of manufacturers’ carelessness or misconduct. We represent victims of dangerous drugs nationwide, including in New York, California, Pennsylvania, Illinois, Ohio, Texas, and Florida. Call us at 312-462-1700 or contact us online to schedule a free consultation with a Dexilant attorney.